This article is about the album by Enigma. For the epistemological meaning, see A posteriori (epistemology). 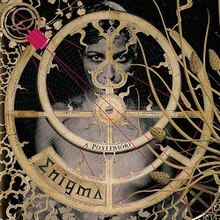 A Posteriori is the sixth studio album by German musical project Enigma. It is Enigma's sixth album. In December 2006, the album was nominated in the Best New Age Album category in the 2007 Grammy Awards. While the previous album, Voyageur, contained minimal amounts of the project's signature sounds, A posteriori only contains the signature "Enigma horn" (a foghorn) during the opening minute of the album, and even then it is a fleeting glimpse. Coupled with the album's subject matter of the collision of the Milky Way and Andromeda galaxies, A posteriori is, compared to earlier releases, stark and foreboding. News about the album's title and track list were first made public on 18 July 2006 through Crocodile-Music.de news page and EnigmaMusic.com's forums, while the album cover was made public ten days later. The first track from the album to be made public was "Hello and Welcome," released as a stand-alone single in 2006. Enigma's management subsequently stated that a new version would be included on the album, while the lead single off the album proper would be "Goodbye Milky Way". A posteriori became first Enigma album to be recorded using Cretu's new 5.1 fully computerized mobile music studio "Alchemist". "Alchemist" represents a machine of comparably small size with main keyboard and a number of hardware MIDI controllers with some "special" expansions and central computer with LCD screen. It was designed for Michael Cretu privately and according to him helped a lot producing music, transferring ideas into sound. "A posteriori", a Latin phrase translated as "after the fact", refers to empirical knowledge, the epistemological concept of deriving knowledge from past experience. "Eppur si muove", alternately spelled "E pur si muove! ", is an Italian phrase translated to "And yet it moves", attributed to Galileo Galilei after he was sentenced by the Roman Inquisition to recant his belief in heliocentrism. Thom Jurek of AllMusic gave the album a mixed review saying "if you like the Enigma sound, this will be up your alley, full of the things you may seek out in a recording, but there is little new here." All songs written, arranged, and produced by Michael Cretu. The Private Lounge Remix album version of A posteriori was released via iTunes Store on 18 March 2007 in Germany and on 26 March in the rest of Europe. ^ a b "The Alchemist Studio" (in Spanish). Enigma Música.com. Archived from the original on 5 September 2009. Retrieved 30 August 2009. ^ "49th Annual Grammy Awards Nominee List". Grammy. Grammy.com. Archived from the original on 20 December 2006. Retrieved 9 December 2006. ^ "New Enigma Album". Enigma News. Crocodile Music Management GmbH. Archived from the original on 30 June 2006. Retrieved 17 July 2006. ^ "Austriancharts.at – Enigma – A Posteriori" (in German). Hung Medien. Retrieved February 20, 2017. ^ "Ultratop.be – Enigma – A Posteriori" (in Dutch). Hung Medien. Retrieved February 20, 2017. ^ "Ultratop.be – Enigma – A Posteriori" (in French). Hung Medien. Retrieved February 20, 2017. ^ "Dutchcharts.nl – Enigma – A Posteriori" (in Dutch). Hung Medien. Retrieved February 20, 2017. ^ "Lescharts.com – Enigma – A Posteriori". Hung Medien. Retrieved February 20, 2017. ^ "Offiziellecharts.de – Enigma – A Posteriori" (in German). GfK Entertainment Charts. Retrieved February 20, 2017. ^ "Italiancharts.com – Enigma – A Posteriori". Hung Medien. Retrieved February 20, 2017. ^ "Portuguesecharts.com – Enigma – A Posteriori". Hung Medien. Retrieved February 20, 2017. ^ "Spanishcharts.com – Enigma – A Posteriori". Hung Medien. Retrieved February 20, 2017. ^ "Swisscharts.com – Enigma – A Posteriori". Hung Medien. Retrieved February 20, 2017. ^ "Enigma Chart History (Top Dance/Electronic Albums)". Billboard. Retrieved February 20, 2017. ^ ""ЗОЛОТО" И "ПЛАТИНА" / International 2006" [Gold and Platinum: International 2006] (in Russian). Archived from the original on 2009-01-24. This page was last edited on 6 April 2019, at 08:57 (UTC).